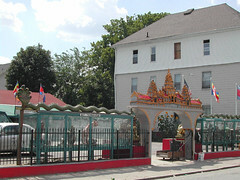 The Wat Thormikaram of Rhode Island has its origins in the late 1970s with the fall of the Khmer Rouge government in Cambodia. Many Cambodians who had been oppressed under the Khmer Rouge then began to flee to refugee centers in Thailand, the Philippines, and Indonesia, from which they later relocated to third countries such as Australia, Canada, France, and the United States. A significant number emigrated to Providence, Rhode Island, including the monk Venerable Maha Ghosananda, who has become a celebrated international peace activist and three-time Nobel Peace Prize nominee. Ghosananda and his followers initially met in the Cambodian immigrants’ own homes until in 1981 they received nonprofit status as The New England Buddhist Center. Ghosananda resided with and served the community from the 1980s until 1994-5, during which time they changed its name to the Khmer Buddhist Society of New England and constructed their first temple, the Wat Thormikaram. When their original building burnt down in March of 1996, the community purchased a residential home across the street for use as a monastery and built another structure that they currently use as their main temple. They also have a model, plans, and an architect for a more elaborate temple they hope to construct soon. 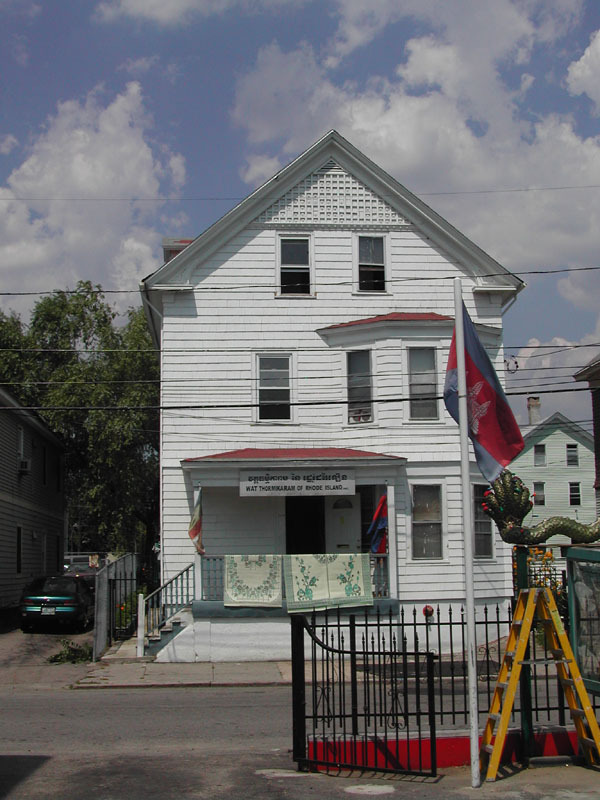 The secular Cambodian Society of Rhode Island has purchased a private home next door with plans to construct a Cambodian cultural center and museum. 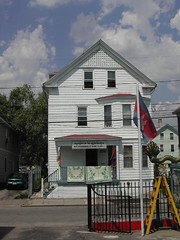 The Cambodian population in Rhode Island in 1987 numbered 7,000 and it has since grown to 10-13,000. An estimated 80% of these people affiliate with this temple. Many live in Providence, but others have moved to suburbs such as Cranston, Warwick, and Woonsocket. 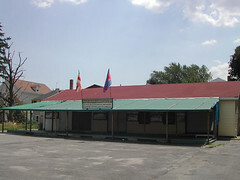 A small temple located on the first floor of the monastery is active every day, but on weekends and holidays the larger community meets in the main temple. Both the monastery temple and the main temple contain elaborate shrines to the Buddha, and religious services consist largely of chanting, honoring Buddha, and making offerings. The main temple has an elaborate gateway with figurines of the twelve animals representing the years of the calendar and models of the great Angkor Wat temple in Cambodia and the temple the Rhode Islanders hope to construct themselves. The temple has worked with the City of Providence to comply with the various codes necessary to convert private homes into public religious spaces, such as by installing an accessibility ramp and sprinkler system in the monastery, which has cost tens of thousands of dollars. 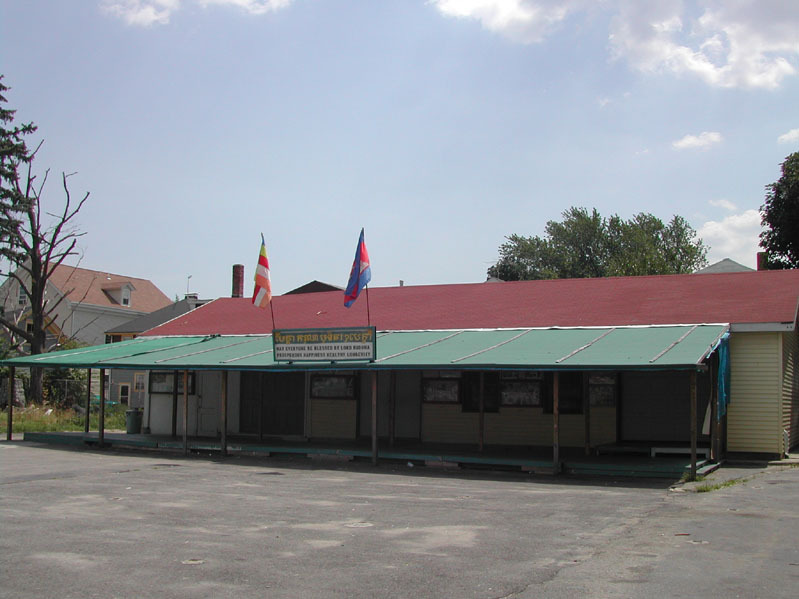 While their Buddhist dharma and discipline remain largely the same as in Cambodia, the temple community has taken on a much wider range of activities than would be necessary there as it seeks to minister to all of the various life needs of its refugee community. 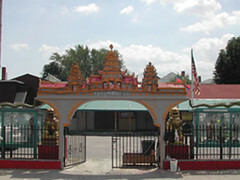 The temple also seeks to be involved in the larger religious and cultural life of the city and state, such as by its collaboration in 2002 with Providence College to sponsor a program honoring “The Spirit of Cambodia” through art exhibitions, music and dance performances, lectures, and films. The temple looks forward to more such collaborations in the future, as well as to increasing its emphasis on youth so as to transmit both the Buddhist religious tradition and Khmer language and culture to the next generation. The expressed purposes of the Wat Thormikaram are: to provide and maintain a Buddhist center for the Cambodian people of Rhode Island; to provide traditional religious and cultural services for people of all ethnicities and origins who wish to learn, understand, practice, respect and protect Cambodian culture and the tenets of the Buddhist faith; and to help younger Cambodians to appreciate their ancestral traditions, culture, and heritage.